Mouse anti Bovine interleukin-4 antibody, clone CC303 (MCA1820) used for the identification of interferonγ expressing dog lymphocytes by flow cytometry. From: Costa-Pereira C, Moreira ML, Soares RP, Marteleto BH, Ribeiro VM, França-Dias MH, Cardoso LM, Viana KF, Giunchetti RC, Martins-Filho OA, Araújo MS. One-year timeline kinetics of cytokine-mediated cellular immunity in dogs vaccinated against visceral leishmaniasis. BMC Vet Res. 2015 Apr 11;11(1):92. Mouse anti Bovine interleukin-4 antibody, clone CC303 (MCA1820) used for the detection of IL-4 expressing cells in yellow cattle and water buffalo following schistosome infection by flow cytometry. Percentage of IFN-γ and IL-4 positive cells detected by flow cytometry pre and post infection. yellow cattle; (B) water buffalo. Level of significance when compared to water buffalo group at the same time, *p < 0.05. Yang J, Fu Z, Feng X, Shi Y, Yuan C, Liu J, Hong Y, Li H, Lu K, Lin J. Comparison of worm development and host immune responses in natural hosts of Schistosoma japonicum, yellow cattle and water buffalo. BMC Vet Res. 2012 Mar 13;8:25. Spleen cells from immunized BALB/c mice were fused with cells of the mouse SP2/0 myeloma cell line. Pedersen, L.G. et al. (2002) Identification of monoclonal antibodies that cross-react with cytokines from different animal species. Vet Immunol Immunopathol. 88 (3-4): 111-22. Aasted, B. et al. (2002) Cytokine profiles in peripheral blood mononuclear cells and lymph node cells from piglets infected in utero with porcine reproductive and respiratory syndrome virus. Clin Diagn Lab Immunol. 9 (6): 1229-34. Nielsen, L. et al. (2009) Lymphotropism and host responses during acute wild-type canine distemper virus infections in a highly susceptible natural host. J Gen Virol. 90: 2157-65. Jaber, J.R. et al. (2010) Cross-reactivity of anti-human, anti-porcine and anti-bovine cytokine antibodies with cetacean tissues. J Comp Pathol. 143: 45-51. Fellman, C.L. et al. (2011) Cyclosporine A affects the in vitro expression of T cell activation-related molecules and cytokines in dogs. Vet Immunol Immunopathol. 140: 175-80. Araújo, M.S. et al. 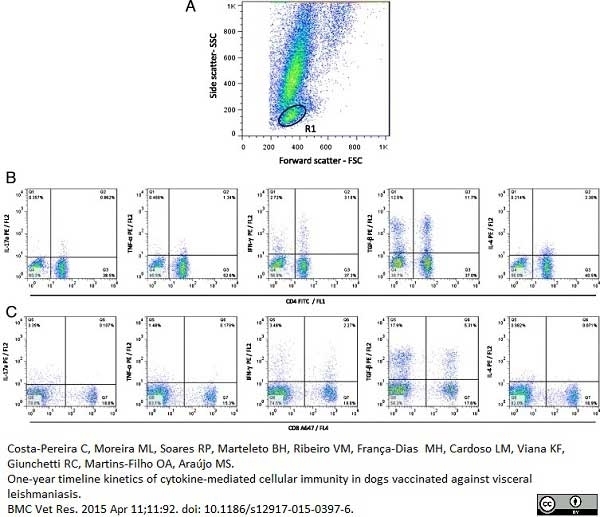 (2011) Immunological changes in canine peripheral blood leukocytes triggered by immunization with first or second generation vaccines against canine visceral leishmaniasis. Jensen, P.V. et al. (2003) Cytokine profiles in adult mink infected with Aleutian mink disease parvovirus. Can J Vet Res. 73: 137-43. Rutigliano, J.A. et al. (2008) Screening monoclonal antibodies for cross-reactivity in the ferret model of influenza infection. J Immunol Methods. 336: 71-7. Wagner, B. et al. (2008) Characterization of monoclonal antibodies to equine interleukin-10 and detection of T regulatory 1 cells in horses. Vet Immunol Immunopathol. 122: 57-64. Dean, G.S. et al. (2005) Minimum infective dose of Mycobacterium bovis in cattle. Infect Immun. 73 (10): 6467-71. Araújo, M.S. et al. (2009) T-cell-derived cytokines, nitric oxide production by peripheral blood monocytes and seric anti-Leishmania (Leishmania) chagasi IgG subclass patterns following immunization against canine visceral leishmaniasis using Leishvaccine and Leishmune. Yang, J. et al. 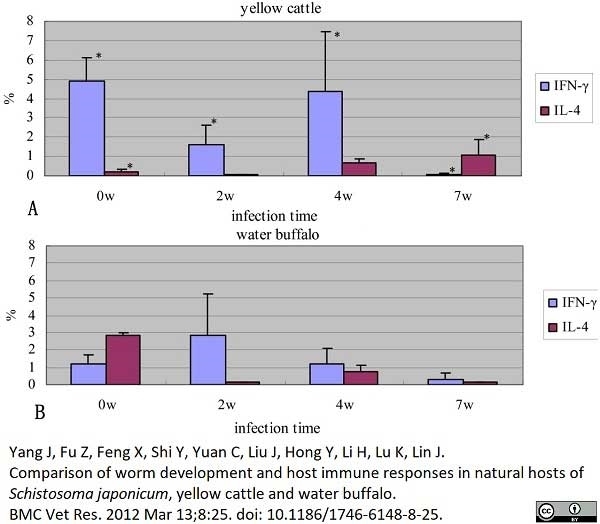 (2012) Comparison of worm development and host immune responses in natural hosts of Schistosoma japonicum, yellow cattle and water buffalo. BMC Vet Res. 8: 25. Taubert A et al. (2008) Antigen-induced cytokine production in lymphocytes of Eimeria bovis primary and challenge infected calves. Vet Immunol Immunopathol. 126 (3-4): 309-20. Geherin, S.A. et al. (2013) Ovine skin-recirculating γδ T cells express IFN-γ and IL-17 and exit tissue independently of CCR7. Vet Immunol Immunopathol. 155 (1-2): 87-97.